Content is the lifeblood of social media. Unless you’re a famous celebrity with a huge following, you need to share great content to keep people interested. But what does that look like? Before you start randomly Tweeting and posting pictures on Instagram, create a social media content management plan to guide you along the way. Having a plan in place will help you stay organized, plan ahead and scale your social media marketing strategy. As your company and social following starts to grow, you spend more time responding to Tweets and juggling multiple profiles. Build a solid foundation now so you don’t have to scramble to figure things out later. First and foremost, you need social media management software. 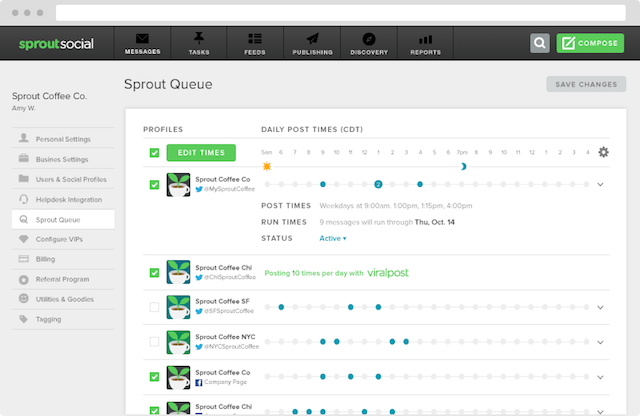 Sprout comes with publishing, analytics and engagement features that’ll help you with just about every step of your social media content management plan. You can try Sprout for free with a 30 day trial! BuzzSumo lets you see content that was highly shared on social media based on the keywords or websites you enter. You can use BuzzSumo to discover new content ideas and see what topics are popular in your industry. Hopefully your social media marketing efforts result in new traffic to your website. You can use Google Analytics to see how many visitors come from each social network, and even measure the quality of the traffic. There’s more to social media content than sharing links to blog posts and broadcasting messages. You also need to be on top of the conversations going on about your brand. When people are talking about your company or products on social media, respond to them as quickly as possible to show you care about what your audience thinks. It can also help you earn new leads. Sprout is great for monitoring brand mentions on sites like Twitter, but forums, blog posts and other platforms all have a social component that you should monitor as well. Google Alerts will send you notifications any time it finds a mention of your brand on a website. You might also want to add alerts for different variations of your brand name, popular products or other important brand keywords. This should be enough tools to get you started. You can also check out our huge list of 185 content marketing tools for more suggestions. Now that you have your toolkit ready, let’s go over how to actually create a social media content management plan. Every piece of content doesn’t serve the same purpose. Figuring out what your goals are before you create your content plan gives you direction on where to go. You might not have the same goals for each network. For instance, you could use Twitter primarily as a customer service platform where you answer incoming questions. But then your goals for Instagram could be to build brand awareness. Measurable: Attach a metric to your goal so you can measure your progress. 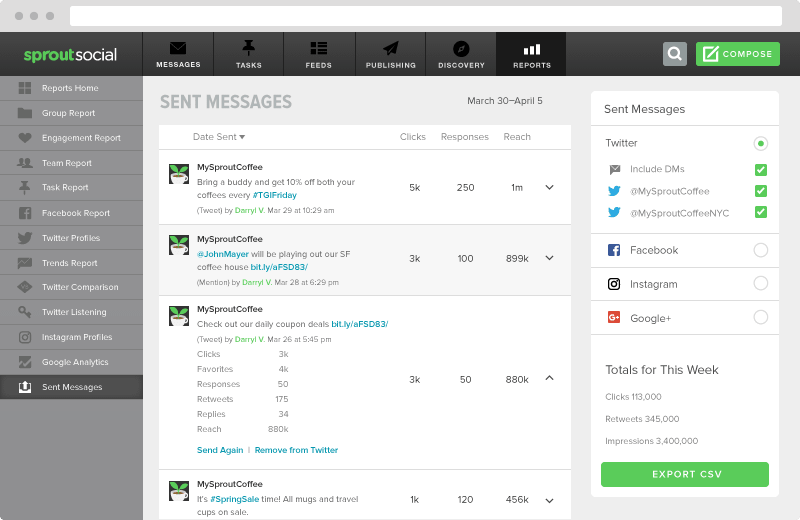 For example, it could be reach, new website visitors or leads. Achievable: Will you actually be able to achieve this goal? Make sure you’re being reasonable with your expectations. Realistic: You should have the resources and desire to achieve your goals. For instance, it’s possible to double your social media traffic within 60 days. But do you have the time, resources or drive it will take to meet that goal? Time sensitive: Your social media goals should have a time frame. The trick here is setting a timetable that’s reachable, but not so far out that there is no pressure to achieve it. Setting a time frame of 12 months to increase your social media reach by 10% is too easy. A good starting point for most social media goals is around 3-6 months. Here’s a helpful worksheet from Marketing Land to help manage your goals. With your goals in mind, the next step is to put together some content ideas. Think of this step as a rough draft of your social media content calendar. You don’t need to have the exact copy you want to Tweet or post to Instagram yet, just a general idea of what type of content is a good start. For example, you might want to host a contest in February for Valentine’s Day, Tweet about fun hashtag holidays or live Tweet an upcoming industry event. You can jot down all those ideas, but don’t worry about crafting the exact posts yet. You’ll get more specific in the next step. If multiple people work on your social media marketing, this is a great time to bring them together for a brainstorming session. Everyone can pitch in ideas for what you want to publish for the quarter and get the creative juices flowing. Once you’ve come up with some solid ideas, you can go through them all and put together something more concrete. Now that you have all of your content ideas, it’s time to put them all into a calendar and plan out your publishing schedule. You’ll probably have a different cadence depending on the networks you choose, so your calendar will give you a bird’s eye view of everything in one place. There are a few different tactics you can use to put together a calendar like a spreadsheet or even Google Calendar. However, we recommend using a social media content calendar. 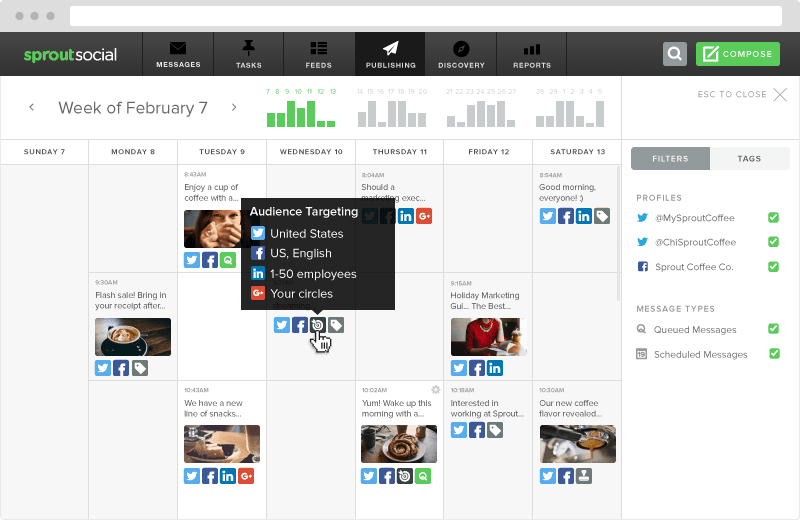 We have a calendar built into Sprout Social that’s perfect for scheduling your social content. You can see exactly which networks you’re posting to, which profiles you’re using, any targeting you selected and the content that’s being published. The biggest benefit of using a calendar like this instead of relying on spreadsheets or external calendars is you have the flexibility to make changes. For instance, if you notice you scheduled a Tweet at the wrong time, you can quickly swap it to the correct time all in your dashboard. If you have a larger team, having a calendar like this is a major convenience. Everyone can see what’s being published for the next few weeks or months, so nobody’s left in the dark. Also, if you have newer team members scheduling posts, you can use the calendar to make sure they’re publishing at the right times and look over all the content before it goes live. A common question about scheduling is how far out should you organize your social media content management plan? One of our social media managers, Darryl Villacorta, recommends scheduling quarterly. If you have brand specific campaigns that will extend beyond the three-month mark, you don’t need to schedule it all at once. Just have the copy handy and schedule anything outside of the three months later. Scheduling your content quarterly also helps for posts with a limited shelf life. You don’t want to share stale content or miss an opportunity to post something timely. After you’ve had a chance to publish some posts and get some engagement, the next step is to analyze and measure the results. The goal is to figure out what works for your audience and what doesn’t. For example, you might notice the Facebook posts you send out in the afternoon aren’t getting any engagement. That could be a sign you need to adjust your posting times. 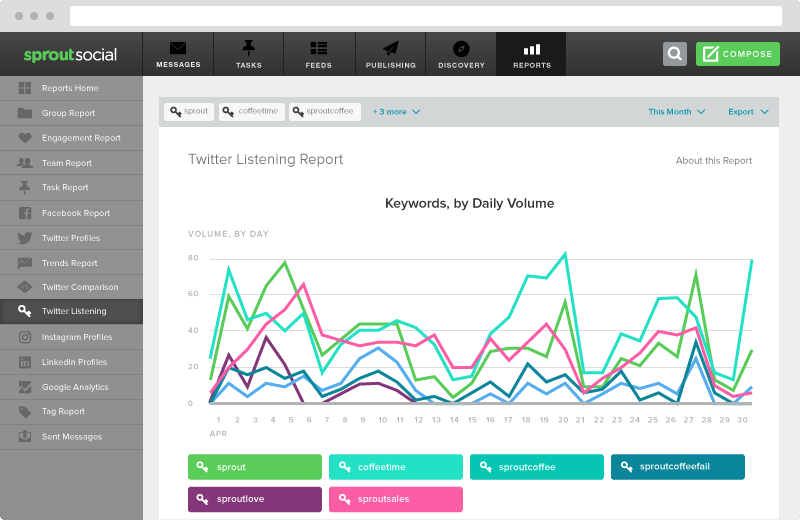 In order to track all of this, you need social media analytics tools. A lot of the metrics and stats you’ll look at will be based on your goals. You’re checking to see if you’re meeting your goals, where you’re falling short and also to spot any opportunities. Start by measuring your results on a weekly and monthly basis. Measuring weekly will give you short-term social media data and the monthly results will allow you to see trends. Then you can measure quarterly to get an even clearer picture of how your content management plan is working out. Look for all the little details that cause certain posts to do better than others. Then you can move onto the final step in our process. After analyzing your content, you should have an idea of changes you can make to get better results. Now it’s time to put it into action. You don’t need to completely redo your strategy every month or quarter. Making a bunch of drastic changes all at once makes it difficult to see what works and what doesn’t. Instead, make small adjustments and measure the results. Over time you’ll refine your strategy and consistently improve. If you notice you’re not gaining any traction after months of sharing content and making changes, then it could be worth making some bigger shifts in your strategy. Social media content management isn’t something you can (or should) set and forget. As your audience grows and your brand evolves, so will your social media content management plan. Whether it’s publishing more frequently, experimenting with new platforms or sharing different types of content, never get stagnant or complacent with your strategy. Always look for ways to improve, even if its something as minor as Tweeting one extra time per day or trying a new headline formula. Do you have a social media content management plan in place? Leave a comment and let us know your biggest tip for putting it together.